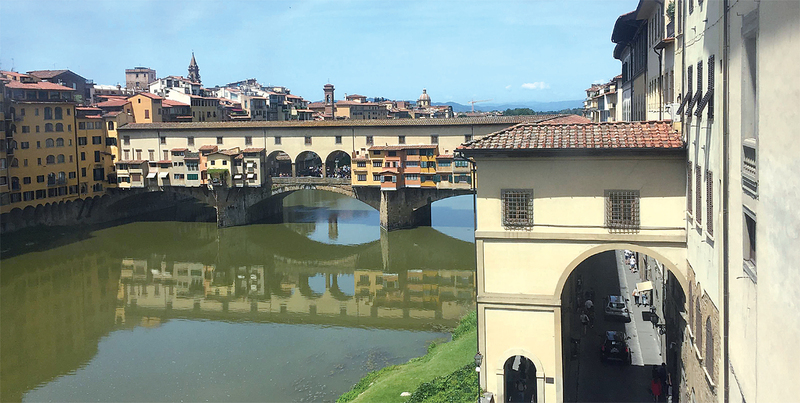 Three things come to mind when people think of Florence: Michelangelo’s David, the Piazza del Duomo (with its cathedral, Giotto’s bell tower and Ghiberti’s magnificent doors), and the Degli Uffizi, one of the most famous art museums in the world. These are written about in every magazine article or travel guide book; they star in every movie or documentary made on Florence; they are the excited subjects of tourist photos and souvenirs. For many people they are Florence. 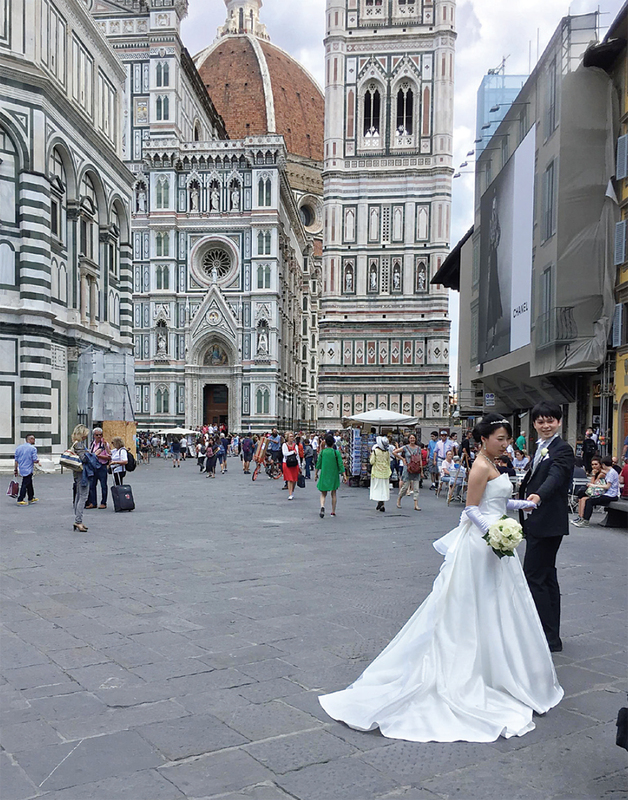 When we decided to revisit Florence, I made up my mind to explore her beyond the Big Three. I wondered whether I would find enough to fill my days. Today, after a most wonderful set of experiences I can say that if Paris is the most beautiful and Kyoto the most exotic, to me, Florence is the most dramatic city in the world. It is dramatic in the sheer omnipresence of the works of immortal artists and sculptors. In every other city in the world you go into museums to see Renaissance art. 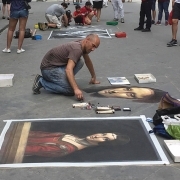 In Florence, sculptures by immortals like Donatello, Michelangelo and Ghirlandaio, terracottas by Della Robbia and murals by Andrea del Sarto adorn buildings and churches in such profusion that after the first startled day, you learn to pass them by without a second glance. No wonder the hordes of tourists look dazed and overwhelmed! Interestingly, Florence has been found to create a temporary but real psychosomatic disorder called the Stendhal syndrome in some people. This causes them to feel dizzy and faint from the emotional impact of so much art around. The Palazzo (palace) Vecchio and the extremely large square before it, the Piazza della Signoria, encapsulate for me the layered drama of Florence. The Palazzo Vecchio itself is a fabled place. When Florence was a Republic, the people elected a government (signoria) of nine people every two months. For this term, the nine were expected to live and work in the Palazzo Vecchio. Later it became the palace of the ruling Medici; today, it is the town hall of Florence. 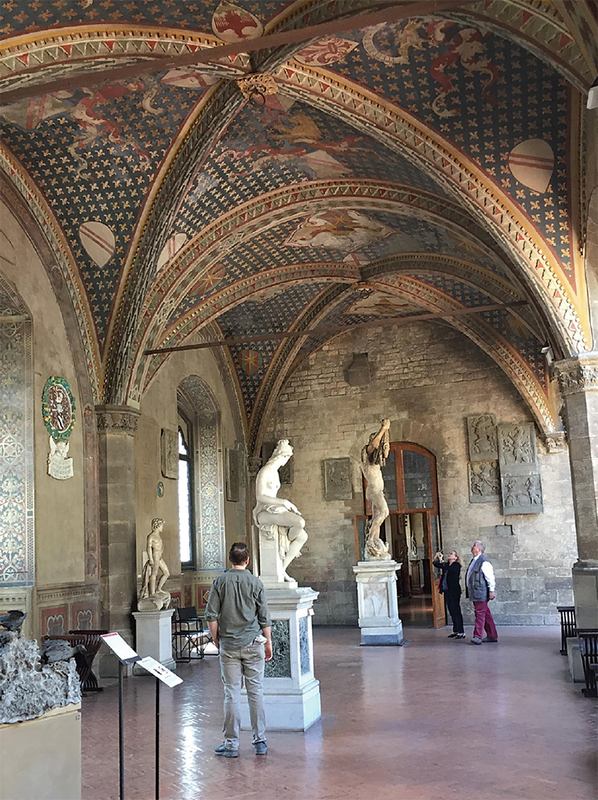 Well worth a visit, the Palazzo Vecchio is not only a treasure house of Italian art but has many mysterious secret passages and secret rooms, all with their individual stories. One of these, the Studiola of Francesco I, was stumbled upon after hundreds of years, only in the 20th century. The high clock tower, which today lends grace and elegance to the monolithic structure, has a prison cell that at one time imprisoned no less than Cosimo de Medici. 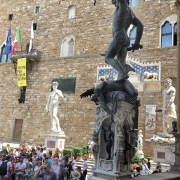 The Piazza della Signoria itself has a lot to see: the Loggia Lanzi (an open-air arcade of famous sculptures including Cellini’s bronze Perseus), an amazing marble and bronze fountain of Neptune in a chariot pulled by seahorses, a life-sized copy of Michelangelo’s David (the original is nearby in the Accademia), an equestrian bronze of Cosimo I by Giambologna, and Bandinelli’s Hercules. Today, it buzzes with gaily dressed tourists, cameras at the ready, gabbling in excitement at what they see around them, spilling ice cream, chasing children, laughing and happy. This same Piazza however hides a history of violence and drama. For the longest time, public executions by burning, beheading and hanging took place here. When the monk Savoranola held Florence to ransom with threats of fire and brimstone, condemning the Arts as worldliness, this Piazza is where he held the infamous Bonfire of Vanities. Several jewels of the Renaissance were lost in this fire. Botticelli, totally under the monk’s spell, personally burnt some of his paintings. Thankfully, the Primavera and Birth of Venus survived and today hold crowds spellbound at the nearby Uffizi. The Florentines saw through the monk by 1498, imprisoned him in the Palazzo Vecchio and hanged him in this same square. Today, a plaque indicates the site of his death. Florence’s past has been nothing if not dramatic. It started as an R&R centre beside the River Arno for Julius Caesar’s centurions. He called it Florentia, which means flourishing. Flourish it did. At the dawn of the 15th century, Florence was firmly rooted in trade and banking. Rich families vied to adopt chapels in over 70 churches, name them after themselves and then employ artists to decorate them as standing memorials to their faith, wealth and status. This seems to have been the genesis of the Renaissance. I visited one such, the Brancacci chapel, not expecting very much. I came away understanding just how different pre- and post-Renaissance art is. There on the little chapel walls are two clearly contrasting styles. 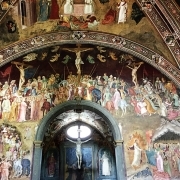 Some of the frescoes are brilliantly painted but lifeless—the rigid art of Gothic times. Then there are Masacchio’s frescoes. Painted in 1422, when he was only 23 years old, these life-filled figures, flawed, human, believable, evoke an emotional response. This is the new naturalism of the Renaissance. In that little chapel, the contrast makes for an amazing viewing experience. From there it all happened—and it was fuelled by one mercantile family, the Medici. Fabulously rich bankers who ultimately ruled Florence, the Medici actively championed the Arts. As a result, over the 15th and 16th centuries Florence became a magnet for the greatest collection of geniuses the world has ever known. The likes of Michelangelo, Da Vinci, Botticelli, Galileo, Poliziano, Donatello and Brunelleschi changed our world forever. It became a bit of a competition, each family trying to outdo the other in commissioning paintings, sculptures, buildings, façades. Nor was this done in anonymity. The beautiful marble front of Santa Maria Novella for example, has the name Rucellai emblazoned across it, so that all the world could know just which wealthy man had paid for the façade. As a matter of fact, Rucellai apparently said that he enjoyed patronising the arts to honour God, the city and to “celebrate myself”. Florence must have been a very ‘keeping up with the Joneses’ kind of place. Walking in the old part of the city, I wondered at the numerous heavy stone torres or towers that point crenellated heads to the sky. A local told me that before the peace of the Renaissance, these were necessary as household defence against clan wars. High towers signalled power—the higher the tower, the more powerful the family. This, of course, set off a competitive war of the towers. When the Florentine republic was founded in the 13th century, the Government, probably sick and tired of this peculiar method of self-proclamation, banned new towers and actually cropped the height of existing ones. The focus then promptly shifted to signalling status through magnificent palazzos or palaces. These now dot every narrow road, one more splendid than the other. 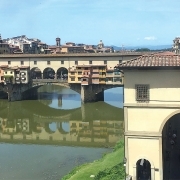 This status-focus has given Florence some very dramatic architectural features such as the Vasari corridor. Cosimo Medici I moved around 2 km away, to the massive Palazzo Pitti across the River Arno, but continued to govern from the Palazzo Vecchio and Uffizi complex. However, the dear man did not wish to walk the earth like other mortals. 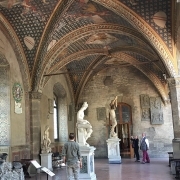 So he asked his architect Vasari to build a sky-corridor. Starting from the upper floors of the Palazzo Vecchio, this window-lined corridor drives through the first floor of the Uffizi, runs atop the buildings that line the Old Bridge across the Arno, cuts through private dwellings and even a church, before it enters the Palazzo Pitti. Talk of the casual arrogance of power! 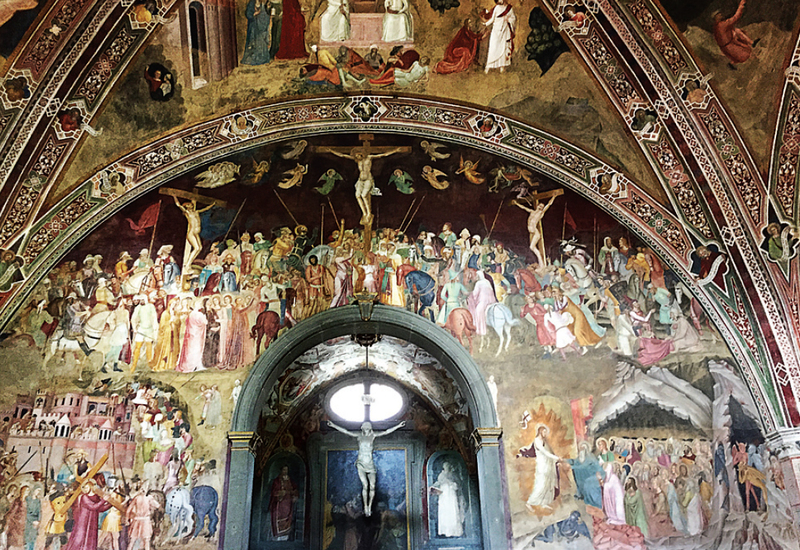 The magnificent churches of Florence are rather like a Renaissance treasure hunt with their vaulting spaces, marvellous paintings and sculptures and historical artefacts. 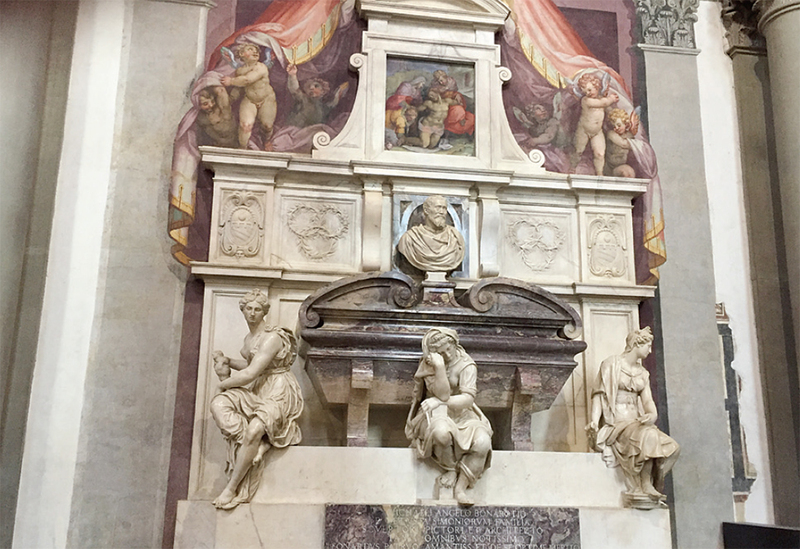 I enjoyed the cloistered peace of Santa Spirito, visited Santa Croce, gaped at Botticelli’s tomb in Ognissanti Church and enjoyed the splendour of the granary-turned-church of Orsan Michele. But what will stay with me as highlights of this trip are two spectacular church experiences. One was completely unexpected. One night, I was reading in our Airbnb apartment just next to the Duomo. Suddenly the bells began tolling. Long, deep, rolling waves of sound, reaching far and wide. I rushed to the window, as beautiful singing rose into the night. Out of the Cathedral, whose intricately sculpted marble façade glowed, came children in white, holding candles, priests in full vestments, choristers singing a capella, people dressed in velvet cloaks and costumes of Renaissance times. Under a golden canopy walked the Archbishop in golden robes, carrying the Eucharist in a monstrance, surrounded by the panoply of the Catholic Church. Slowly they moved out of sight into the streets of Florence. This was the procession of the Celebration of Corpus Domini and I am humbled to have witnessed some part of it. The second was sheer happenstance. One evening I went into the Badia Fiorentina, the church that features in Dan Brown’s Inferno, simply to rest my weary legs. As I entered, I was surprised to see nuns and priests coming in and out, settling on carpets before the high altar, people sitting silently on the pews. I settled down myself. It was almost 6 pm. As the bells tolled the hour, the nuns and priests began a deeply musical chant, their voices harmonising and reverberating around the high church roof as if they were a highly trained choir. For an hour, I sat while the absolutely beautiful rite of evensong was conducted. It is an indescribable memory. Sitting in a church founded in 978 AD, incense curling in the still cool air, the gold of the paintings and crucifix glowing in the fading daylight, the clergy in their simple white and grey robes, singing their hearts out. A deeply meditative experience. 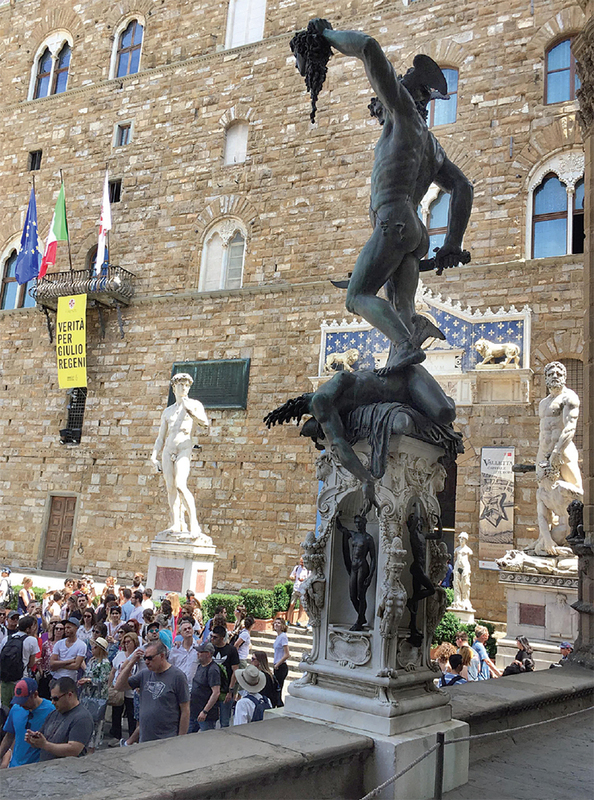 Summer, it is true, is a time when there are far too many tourists in Florence. One day, choked with the crush of people in the old part of the city, I went into the Oltrarno area, across the river Arno. This is a completely different experience, a little like the Left Bank in Paris. There are fewer tourists and the area is full of small workshops of artisans working in leather, tailoring, mosaic and jewellery. The little cafes and restaurants have more locals and the prices are nowhere near the ‘tourist’ prices of the ‘Right Bank’. From Oltrarno, I went on a long winding walk up a hillside. As I said before, Florence is dramatic. Even its green getaways fit this description. I walked up paths covered in drifts of leaves, surrounded by tall trees, often framed against medieval stone walls. Banks of wildflowers nodded at me from hillside slopes on which churches, a fortress and what looked like a castle caught my eye. Right at the top of Mon Fiorentinus hill stands the church of San Miniato al Monte built on the site of a hermit’s cave. From its peaceful courtyard high above it all, Florence spread before me. The Arno twinkled in the sun, the city’s red-tiled roofs and magnificent monuments blended into green rolling hilly country all around. Descending, I entered a rose garden open to the public, sat on a bench surrounded by contemporary sculpture and ate a lovely picnic lunch while marvelling at the view. I felt happy. Florence as a city has many stories and continues to add more and more as time goes by. 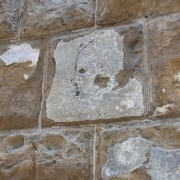 One of the famous ones concerns a little face etched into a stone block somewhere on the façade of the Palazzo Vecchio—an act of high vandalism of course. But what has made this the most famous bit of street art in the world is the author of this outrage: Michelangelo himself. 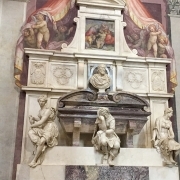 Some say he did this, back turned, as a dare; others that caught by a bore, Michelangelo carved the bore’s likeness in the stone as he waited for the conversation to end. Of course, I wanted to see it. 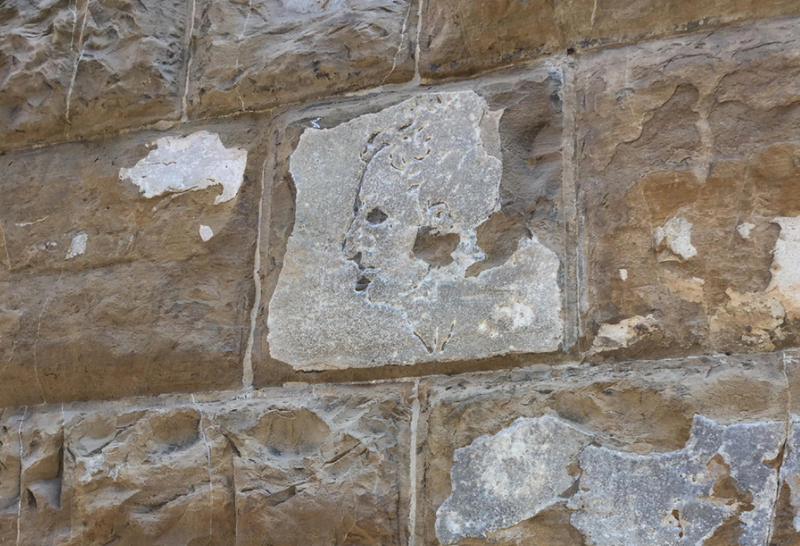 So I stood, slowly scanning the vast façade of the Palazzo Vecchio, stone by stone. It was only when I caught a youngster giggling at me that I realised just how peculiar I must seem to people who had not heard about the Michelangelo face. Imagine an elderly lady who turns her back on all the great art in the square to peer solemnly at stones on the outside of a huge building. Thank God I found that face finally! 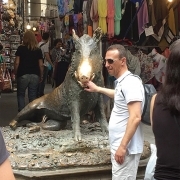 Another funny sight is Il Porcellino: a bronze life-size Caledonian boar, all open mouth and vast tusks, sitting on a plinth at the Mercato Nuevo. This statue, it is said, can grant wishes if a coin dropped into its mouth tinkles as it falls into its fat belly. The ritual ends with the wisher giving the snout a jolly good rub. 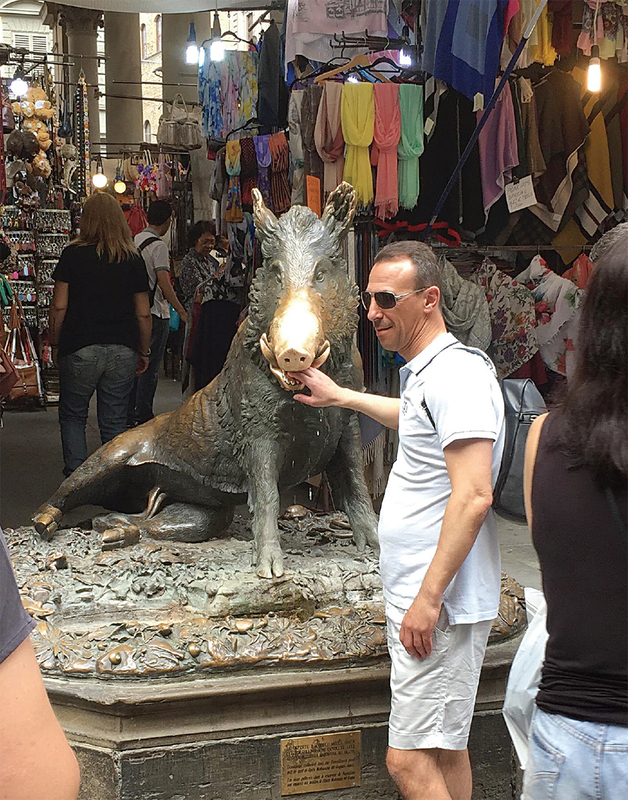 Every moment of the day, Il Porcellino has a steady stream of tourists dropping, listening and rubbing… the Municipality must make a fortune. Over the years, the boar’s green bronze patina has turned a bright gold on the snout because of the constant assault of credulous tourists. The world-famous Santa Maria Novella pharmacy hails from the 17th century and is a must-visit to pick up handmade soaps, scents and lotions made by the nuns of the convent. One of their products has a slightly gory story. During the plague of the 17th century, seven men approached the nuns in Santa Maria Novella begging for a protective against contamination from plague victims. Moved, the nuns poured their hearts into the effort, labouring long and hard over herbs and distillations, finally producing an effective product. The men promptly doused themselves with the powerful preparation and set about robbing all the corpses of those dead from the plague in the streets of Florence. The product is sold even today under the name of Acettodeisetteladri—the smelling salts of seven thieves. I could go on and on, forever. About the church where Dante first saw the love of his life, Beatrice Portinari; the bull head atop a column at the Duomo, its horns pointing at the shop owned by a man cuckolded by the carver; the strange stone head that pokes out of the wall of Santa Maria Maggiore; the magic eye of Renaissance times that was a removable stone let into the first floor of houses… Florence is dramatic. 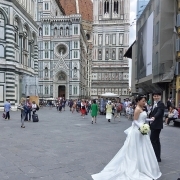 Florence abounds in stories. But Florence is also a fun place, with young vibrant people spilling out of cafes, restaurants and shops. Late into the night, we explored streets full of safe, happy, laughing people, listening to street musicians, watching the gaily decorated carousel in the Piazza della Repubblica, marvelling at the multilayered city Florence is. One abiding memory of the fun side of this beautiful city will be the street art of Clet Abraham and Blub. Clet, at dead of night, steals out and embellishes traffic signs, careful not to change their meaning, merely making them fun. One of his best is a ‘No Entry’ sign on a street corner where the horizontal bar now has a policeman hugging the bar while hearts float around the frame. Clet calls it Policeman in Love. Blub is a modern Florentine mystery. Who it is, no one knows. Whether man or woman, no one knows. But Blub’s posters adorn many a city wall, flawlessly combining old and new, depicting old masterpieces in a new and engaging way. 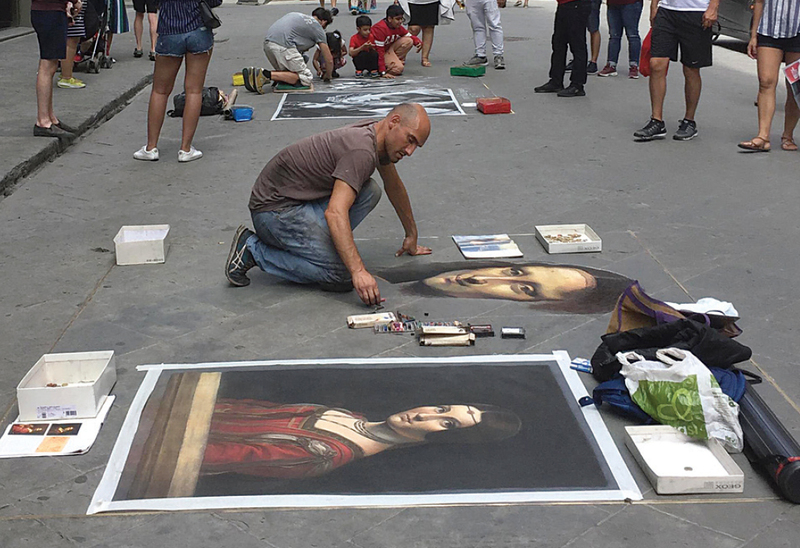 Rather than seeking to ban or punish them, Florence has seamlessly absorbed them into the continuous narrative of this art-filled city. Today, tourists actually go around excitedly identifying the works of these artists. They have simply added to the stories of this storied place. My husband and I spent two weeks in Florence. When friends heard this was what we intended to do, reactions ranged from the amused to the amazed. The consensus was that we would regret our decision within five days at most. I am happy to say that they were wrong. I have enjoyed thoroughly both aspects of Florence. She is a beautifully preserved Renaissance wonder as well as a modern, vibrant, fun-filled city. Even now, after such a long stay, I realise there are still many layers I have not explored. This, I feel, is the best way to say goodbye to a city—grateful that I have seen so much, sorry that there is still so much left to see. There is no doubt in my mind at all. Florence flourishes. Florence is well connected with the rest of Italy and Europe, and is easy to reach by air or land. It is also a key node on the Italian railway network. The A1 motorway, the main road artery linking the north and south of the country, runs past Florence, which has four exits. The choices are plenty as almost every other house, apartment block and palazzo in the city masquerades as a hotel, pension or B&B. Nearly all the museums are closed on Mondays. Also, there is no single ticket that can be used for all the museums. Besides the traditional tours, there are other fascinating things to do, such as the ‘secret paths’ inside Palazzo Vecchio, with the possibility of seeing rooms that are normally ‘off limits’. Vacationing in Florence also means enjoying local products, including wine, bread and olive oil. If your budget is limited, try restaurants between San Lorenzo and the railway station. For those keen on shopping, look out for bags and accessories in leather. If you’re looking for good deals, there are many flea markets such as San Lorenzo, Mercato delle Pulci and Mercato Nuovo.